Interesting article in The Guardian (from some time ago, I’m a slow reader) about the overblown importance attributed to doing experiments during science lessons. the teacher demonstrates and students (at best) trying to observe what happens. students do the experiment in large groups, by adhering to a strict series of steps outlined in a worksheet. students work in large groups, in which usually only one or two students do the work, The others are merely bystanders. the procedure, observations and interpretation of the experiment are laid down in detail beforehand. The article touches upon two interesting elements. First, there is the questionable educational value of many experiments in science classes. secondly, there is the challenge to measure lesson quality beyond ‘ticking off’ the occurrence of activities such as experiments. The article refers to ‘The Fallacy of Induction‘ from Rosalind Driver. Her book ‘Making Sense of Secondary Science’ is an excellent book on misconceptions in science education and has been an important inspiration for me. “Driver doesn’t dismiss practical work in science, but argues that ‘Many pupils do not know the purpose of practical activity, thinking that they ‘do experiments’ in school to see if something works, rather than to reflect on how a theory can explain observations.” (Driver et al, 1993, p.7). The second argument is that pupils don’t arrive in class with a blank slate, but with a whole range of self-constructed interpretations or ‘theories’ on how natural phenomena work. These ‘preconceptions’ require more than an experiment to change, as children tend to fit observations within their own ‘theoretical framework’. “Misconceptions can be changed if they are made explicit, discussed and challenged with contradicting evidence. After this ‘unlearning’ phase, children may adopt a different framework. Driver concludes: ‘Experience by itself is not enough. It is the sense that students make of it that matters” (Driver et al, 1993, p.7). Discussion activities, in which pupils have the opportunity to make their reasoning explicit and to engage with and try out alternative viewpoints, including the ‘scientific one’, need to be central (cognitive conflict). Practical activities can be complementary to these discussions, instead of the other way around, when discussion and conclusion are quickly reeled off at the end of the practicum. steers teachers and programme staff towards focusing on these outward signs, as they know they will be evaluated on these criteria. Collecting valid and reliable data on lesson quality is hard. Self-assessment instruments are notoriously prone to confirmation bias. Lesson observations don’t give a reliable everyday picture of lesson practice. They suffer from the fact that teachers pull out special lessons when visitors appear for announced (or unannounced) visits. Conversely, as Cuban describes beautifully, other teachers tremble and panic when an evaluator walks into their classroom and the lesson becomes a shambles. Evidence-based evaluation is often touted as the way forward for development projects. Randomized trials in health have been useful to collect a body of knowledge on what works and what not. In a randomized trial a group of students where teachers received pedagogical training is compared with a group of students where teachers didn’t receive training. Comparisons can be made with test scores, student satisfaction or drop-outs. However, test scores are unsuitable as exams are notoriously prone to cheating and questions focus on recollecting factual knowledge, the opposite of what we want to achieve. A self-designed test could be a solution, but there’s the risk that programme activities will focus more on the test than on improving teaching skills. Student satisfaction scores are prone to the aforementioned confirmation bias. Drop-outs are hard to use as they are influenced by many interrelated factors such as geography, economic growth and government policy. Ownership by the direct target group on the evaluation is part of the solution in my opinion, as well as using a variety of data sources. In future blog posts I plan to write more on how we try to measure lesson quality. For more detail see this available study from Prof. James Dillon (pdf) on the value of practical work in science education. Dri­ver, R. (1994) ‘The fal­lacy of induc­tion in sci­ence teach­ing’, in Teach­ing Sci­ence, ed. Levin­son, R., Lon­don, Rout­ledge, pp.41–48. Driver, R., Squires, A., Rushworth, P. and Wood-Robinson, V. (1993) Making Sense of Secondary Science, Routledge. 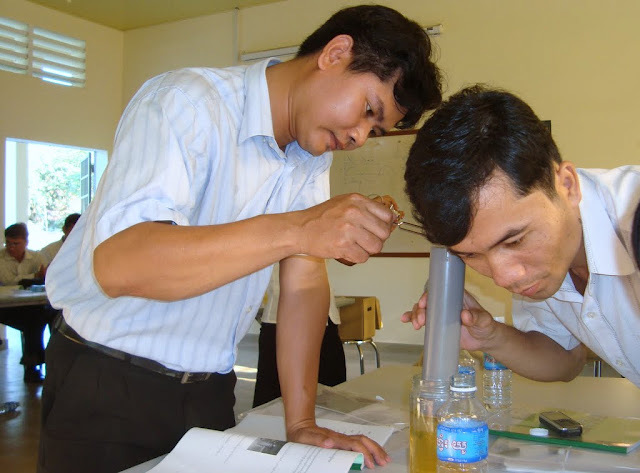 Last week saw the organisation of a workshop on physics education for teacher trainers in Cambodia at the regional teacher training centre in Kandal province. 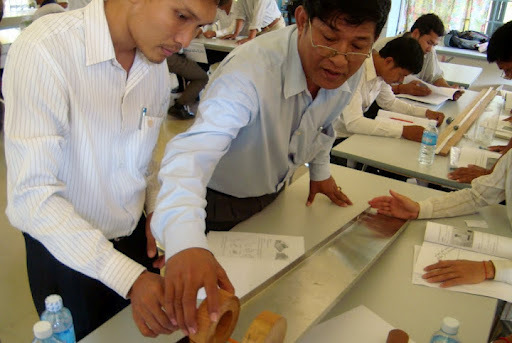 All Cambodian physics teacher trainers were present, what makes around 20 people. The workshop lasted 5 days. Each day we discussed a different part from the curriculum. There were days we focused on sound, mechanics, pressure, optics and electricity and magnetism. The last day participants collaboratively made a lesson plan using materials they’d learned. There was a strong emphasis on low-cost experiments, but also attention for simulations and animations and student-centred approaches. The concept underlying the workshop – and actually the whole programme – is the TPACK concept (Mishra and Koehler,2006; Koehler and Mishra, 2007; Abbitt, 2011), an extension of Shulman’s idea of pedagogical content knowledge. This is knowledge of pedagogy that is applicable to the teaching of specific content. TPACK extends this idea with technologies. 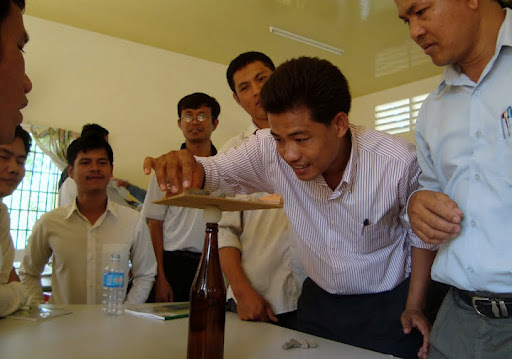 The core idea of TPACK is that the use of technologies in education – and in Cambodia analogous technologies such as experiments, posters or cards play a much larger role than digital technologies – should be considered in relation to content and pedagogy. Just using an experiment or an animation just for the sake of it, without thinking about how it will make your lesson better is not useful. This may seem obvious but many interventions seem to do just this, introducing certain technologies (blogging, wikis…) or pedagogies (concept mapping, learner-centred methodologies…) without detailed consideration of the curriculum content teachers actually have to cover. The workshop is the result of three years of preparatory work with a wonderful team of teachers and teacher trainers from the college in Kandal. Since 2008 we’ve worked with them to select materials and activities for those curriculum topics they found most challenging, try them out in their lessons, develop accessible manuals and short experiment videos (See for example this experiment video on toilet rolls and pressure) and learn to facilitate the activities themselves. Manuals have been officially approved by the Cambodian Ministry of Education, an important milestone in Cambodia, as it means that they can be distributed and endorsed nation-wide. Although we do hope that these manuals by themselves are inviting, an official stamp of approval is likely to act as an extra stimulation. It’s great to see teacher trainers themselves facilitate the workshop without much involvement of us. Above all, they enjoy it as well to explain all these experiments and activities to their colleagues as well. The downside of involving all stakeholders is a very long development cycle. Getting from a first selection of content until the final, approved product has taken us several years. Having a first edition published sooner would have enabled us to envisage a second edition within the programme lifetime. 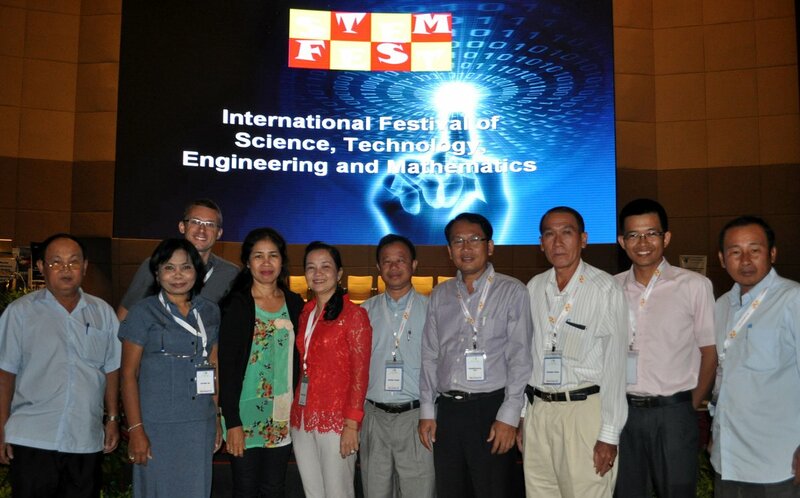 However, our objective is not to organize great workshops, but to improve science teaching. Whether our workshops will have a strong effect on the ground remains to be seen. There are quite a few hurdles between a good workshop and improved learning by grade 7-9 pupils. Teacher trainers may feel insufficiently comfortable with the materials to use them, support from college management may lack, an overloaded curriculum and recalling-based assessment may favour rote learning. Student teachers may misunderstand techniques, fail to see any benefits or be discouraged by their school environment. Targeting teacher trainers has been a deliberate decision. As they teach future teachers the potential impact is very high. However, the adopted cascading strategy bears the risk of a watering down the content. Measuring impact is notoriously difficult, perhaps even more so in Asia, where stated preference methods are prone to response and cultural bias. Despite continuous M&E efforts we don’t have a clear insight yet into the impact of our activities at teacher training level on the pupils. The main reasons are the fact that measuring impact is time intensive, that an observable impact may take time to manifest and that a clear impact of the programme within the messy complexity of teaching and learning in a crowded donor landscape is hard to distinguish. Abbitt, J.T. (2011) ‘Measuring Technological Pedagogical Content Knowledge in Preservice Teacher Education: A Review of Current Methods and Instruments’, Journal of Research on Technology in Education, 43(4). Koehler, Matthew J and Mishra, Punya (2005) ‘Teachers learning technology by design’, Journal of Computing in Teacher Education, 21(3), pp. 94–102. Mishra, Punya and Koehler, Matthew J. (2006) ‘Technological Pedagogical Content Knowledge: A Framework for Teacher Knowledge’, Teachers College Record, 108(6), pp. 1017–1054.